While Sony has already published a list of devices that it says will be updated to Android Nougat, there has been no information on when the update will start arriving. That was, however, until now, as Sony Slovakia – during a presentation – has leaked the company’s Nougat update roadmap. Then December will see the Xperia Z5 series, the Xperia Z3+, and the Z4 tablet getting the update. 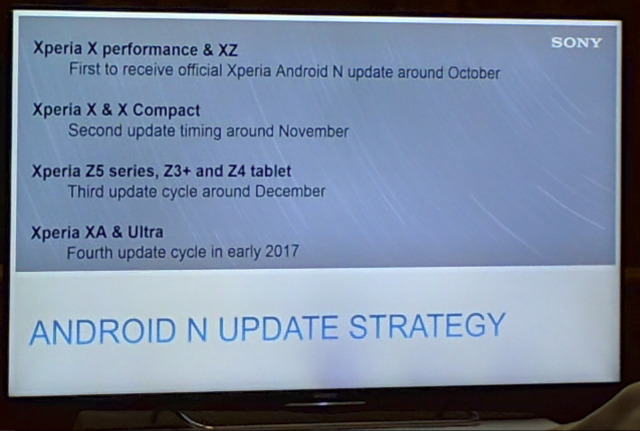 And finally, the Xperia XA and XA Ultra will receive the update “in early 2017″ time-frame.